I lovelovelove trashy eats, especially ones that are fried and on a stick. I remember my first corn dog. I was about 16 and at a friend's house. He grabbed a box of Pogo's out of the freezer and popped them in the oven, as I stared with bewilderment at this beautiful pre-made creation. I had never had a corn dog before -- can you believe it? After briefly cursing my parents for failing me in the food education department, I ate about 3 of them. And then felt like crap. But I knew, despite the stomach pains and food sweats, that I had stumbled upon something wonderful. Since then I've refined my fair food palate and much prefer the non-store-bought variety. 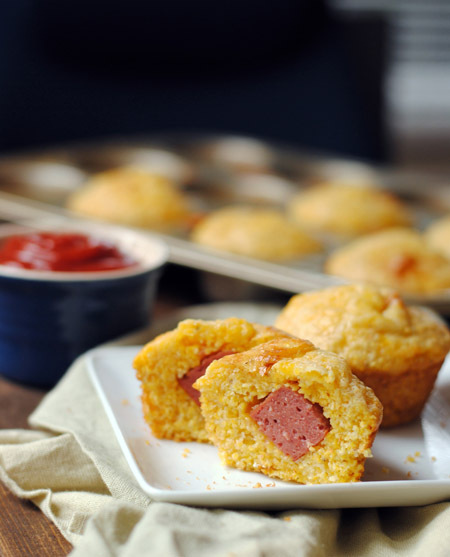 But corn dogs can be messy and annoying, and I can be lazy and in need of instant gratification, so I whipped up a batch of corn dog muffins instead when the craving for something delightfully trashy hit this week. They don't quite hit the same spot the greasy version on a stick does, but they are really, really tasty and totally capture the flavour of corn dogs. I think these will be popping up in my kitchen for a long time to come. 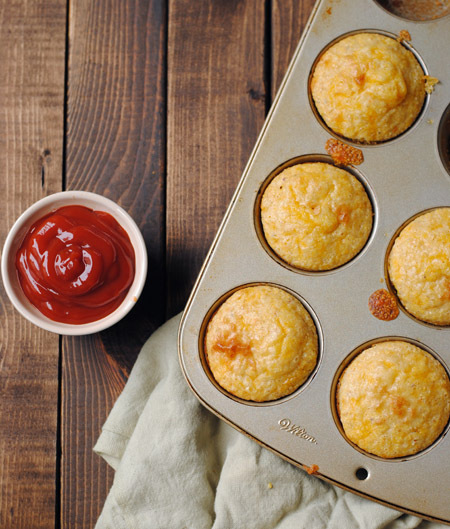 Preheat oven to 400F and grease a standard muffin pan. In a large bowl, combine the cornmeal, flour, sugar, baking powder, baking soda, and salt. Make a well in the middle and add the butter, buttermilk, and eggs. Mix until just combined. Gently fold in the cheese. Scoop the batter into the muffin tins, about 2/3 full. Bake for 8 minutes, then press a hot dog piece into the center. Bake for an additional 8-10 minutes, until golden brown. Allow to cool slightly before removing.